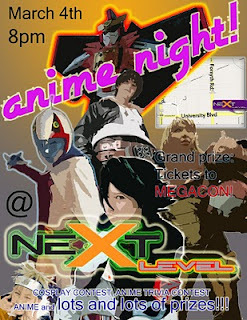 Next Level LAN, located at 6947 University Blvd in Winter Park, will be holding an anime night on Thursday, March 4th at 8:00pm! I have been informed that there will be anime viewings, a trivia contest, and a costume contest. There will be prizes given out including tickets to MegaCon! Reminder! Club meeting his Saturday(2/27) at 5pm! Trigun: Badlands Rumble coming very soon! Recap of today's meeting! 2/13/10 edition! Global Game Jam 2010 games! No Ham for you Ponyo!